For high school and college students particularly, this book is an absolute must-read. Prof. Ryken teaches us the right view of work and leisure, both when understood properly, the basis, the motives, the manners by which we ought to do both, and the goals of them, like other creations, are very good in the eyes of God. The issues associated with work and leisure today that show their ugly heads in workers’ dissatisfaction, time famine, poor work-ethics, poor-quality or wasted leisure time are treated in the early chapters as Ryken proposes their roots being the godless success and consumer ethics. Next, the Reformation view of work and leisure are contrasted against other historical views; for examples, those of ancient Greek, Marxism, and sacred-secular dichotomy, usually promoted by the Roman Catholic Church. 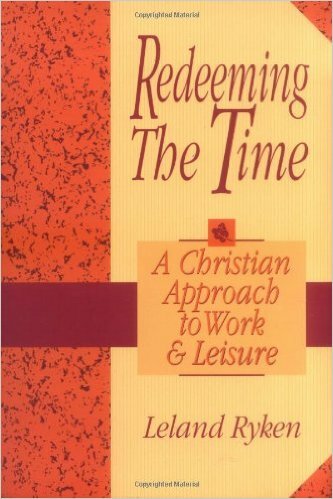 The last section of the book examines what the Bible says about work and leisure, the key of which is found in Genesis; in the life of God and the life of pre-lapsarian Adam and Eve in the garden before work became a curse that affects our view of leisure as well. The examination also includes the New Testament views from Jesus Himself as well as from Ecclesiastes and the epistles of what sanctified work and leisure look like and what the right view of them is, the most important of which is the fact that both are the gift of God that carries the principles of stewardship and God-centeredness in them, that in the end is intended for both His glory and our enjoyment. Strangely, yet truly, the ultimate goal of work and leisure of a service to the glory of God and our satisfaction is nothing but John Piper’s tenet that says that God is most glorified when we are most satisfied in Him (this “in Him” is crucial), even in work and leisure, and everything else indeed. The glory of God and our joy are not two and opposite but one and the same. The reason why this book is indispensable is because Ryken not only offers careful, solid, true, reasonable and fair analysis, understanding and principles of two important aspects that occupy most, if not all our lives, but also how to translate them into actions. For some, they may guide them how to pick a college major and where to work. For others, they may help determine whether one should get another job. For others still, they may mean forsaking questionable unfruitful wasteful ways to spend leisure and look for more satisfying ones; all these have a single ultimate holy goal in view, whether one is a janitor or a CEO, that is, to honor God our Maker by being happy in doing and being a janitor or a CEO, or everything else in between, living for Him. Paperback: 301 pages. Publisher: Baker Books (October 1, 1995). ISBN-10: 080105169X. Price: $24.30.